Sound the horns!! 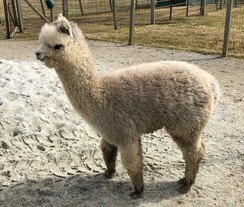 Here at Promised Land Alpacas we have specialized in full Peruvian Black and Greys for years. Many of which have gone on to become “not for sale” foundation males and females at high end farms and ranches across the country. Well – now the day has come….we have just created hands down the BEST FULL PERUVIAN ¾ ACCOYO TRUE BLACK we have ever made!!! We are supremely confident that he will be the next big thing. This boy is dense, dense, dense in a solid Light Silver Grey. Prospector highlights all the requirements for an up and coming herdsire – density, fineness, character, uniformity, brightness, and excellent handle. Conformation is stellar - solid frame, heavy bone, ideal proportions with full coverage, nose to toes. This young male also has the sweetest disposition. Co-owned with our friends, Dawn and Jim Evans of Small Paws Farm, NY.